I have a speed painting of the Dallas Cowboys new superstars Dak Prescott and Zeke Elliott that I created in late 2016 and I've performed it several times before getting booked for some big high profile events. One of which was an event benefiting the Samaritan Inn where Troy Aikman Emmitt Smith and Darryl Johnston were headlining. I was hired to speed paint Dak and Zeke but was also asked to create a portrait of Aikman smith and Johnston. This painting would be signed during a VIP reception after the auction. The winning bidders paid $10,000 and got to meet the guys while they signed it. I was in the VIP party when they arrived and shook Aikman's hand first and he said, "How much did the go for, Ten Grand? I've seen a lot of paintings and this one is impressive. " wow... what a compliment. I also met Emmitt and Moose and was able to take a photo with them and the painting. Moose later told me, "Your work is great. Keep it up." It's humbling to receive these kinds of compliments from such admired athletes and Hall of Famers. Doesn't get much better. I was contacted a few days later by a representative from Albertsons Tom Thumb and booked for another Cowboys even held on April 19, 2017 at the new Cowboys headquarters, The Star in Frisco. This event was intended to honor Jerry Jones' daughter Charlotte Jones-Anderson with a lifetime achievement award. For this event I was hired to once again speed paint Dak and Zeke but also create a couple more paintings. Among them were a portrait of Charlotte was given to her as a gift and a painting of "The Triplets" Troy Aikman, Emmitt Smith and Michael Irvin. 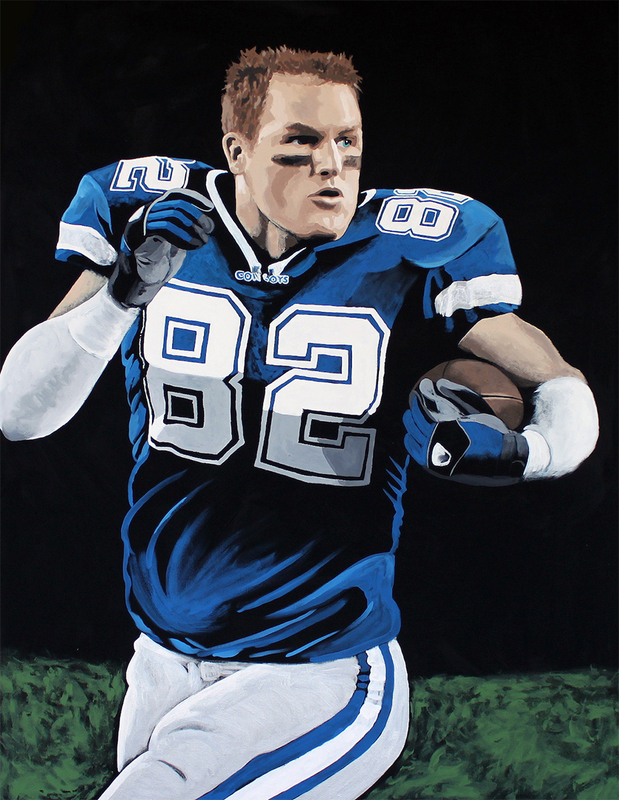 I also did a portrait of Jason Witten. The performance was great and afterwards I got to take a photo with Dak as he signed the picture. Later that night the painting auctioned for $15,000 x 2 paintings. I hope to do more with professional sports teams and pro athletes in the future.